Promo period is from Nov 9, 2018 – Dec 31, 2018. This promotion covers all Shakeys stores nationwide. The said voucher code “SHAKEYSXMAS” entitles the customer to 20% discount for a minimum spend of Php 1,500 on ZALORA in single purchase. A customer can avail of more than one entry provided that he / she meets the purchase requirements stated above. Deadline to join the promo is until 11:59 PM of December 31, 2018 Pizza redemption starts from December 1 until January 9, 2019. ZALORA Philippines and Shakeys reserve the right, with the concurrence of Department of Trade and Industry (DTI), to reject a participant if he / she is unable to satisfy the conditions set out in these promo mechanics. Successful orders will receive an through automatic email generate by ZALORA Philippines after a successful order has placed within 5-10 business days. The ZALORA voucher code “SHAKEYSXMAS” is applicable to participating brands except for brands and categories found on www.zalora.com.ph/faq-non-sale/. 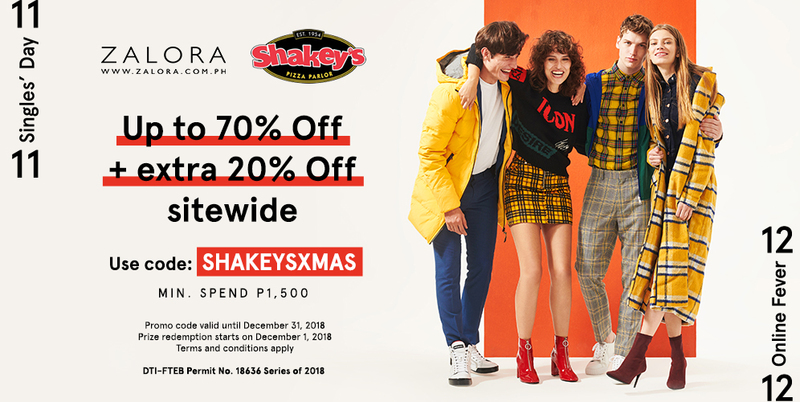 Customers who shop on ZALORA using the promo code “SHAKEYSXMAS” from November 9 to December 31, 2018 will receive a unique, one-time use code offering a Large Manager’s Choice Thin Crust Pizza with a required minimum purchase of PHP 1,500 at any Shakey’s store. Customers may visit any Shakey’s stores nationwide and must show the unique promo code to any Shakey’s staff to avail the promo. An auto-response email will be sent by ZALORA with the unique code for every successful purchase within 5-10 business days. The unique promo code provided may only be used once. Only (1) free pizza may be availed per unique email recipient during the defined redemption period. Promo is valid for dine-in and carry out transactions only at all Shakey’s branches nationwide. Unique promo code cannot be used in conjunction with other promos or discounts. Promo code cannot be combined with SuperCard 10% dine-in discount and Buy 1 Take 1 promo for carry out. In the purchase of goods and services which are on promotional discount, the senior citizen can avail of the promotional discount or discount provided under the Expanded Senior Citizens Act of 2010, whichever is higher. Prizes not redeemed before the scheduled date will be forfeited in favor of Shakeys. ZALORA Philippines reserve the right to verify the eligibility of the orders. ZALORA Philippines will verify the order (via the ZALORA website or ZALORA app), whereas the order should be a valid complete order, with no cancellations, exchanges, returns and refunds. Per DTI-FTEB Permit Number 18636 Series of 2018.